Employee training and professional development are key to the success of any organisation. Corporate training provides your employees the opportunity to improve skills, keep knowledge current, provide professional development and invaluable team building opportunities. Today’s forward-thinking organisations are looking to attract and retain the best employees, therefore should be investing in training environments that have a positive impact on their business. 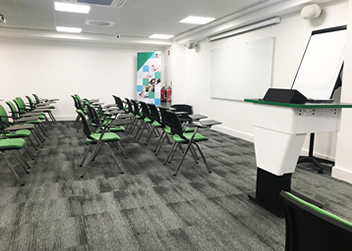 Our comprehensive range of Audio Visual Lecterns are designed to accommodate all types of training rooms, including employee teaching spaces, large lecture theatres and presentation rooms. Our lecterns feature versatile removable rack units that fully integrate AV equipment to facilitate easy configurations for technicians. Each unit comes with complete cable management and provides easy access and a safe environment for all users, with no trailing cables. 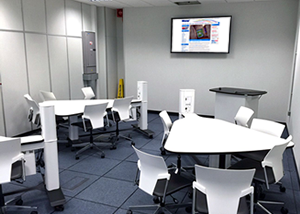 Our SYNERGY tables are ideal for employee training labs. Each table is ergonomically designed to enhance group work and collaboration, allowing users to connect their own devices to the screen for training and discussion purposes. RUBI is an economical multimedia lectern for small rooms. It is a compact solution allowing it to be placed in areas where space is limited. All four sides of these mobile lecterns are lockable and detachable from the frame providing easy access to equipment. The FORUM TEAMWORK DESK encourages communication and idea sharing in two formats, transforming from IT station to writing desk at the pull of a lever. Customised to the required number of users, our FORUM DESK� is designed with collaborative working in mind. A design that reflects your reputation. Configurations that supports both instructor-led and team work methods. Creating a space that fully integrates the latest technology and that can support different devices, without requiring you to be an IT expert or advanced user to be proficient. Furniture that allows you to use the space for other activities when training is not in session. At Dalen, we have a rich history of providing the University market state-of-art active learning suites, particularly in TEAL (technology enhanced active learning models) environments. 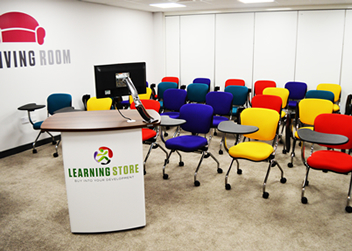 This experience that we work on a consultative level to understand your training requirements and work with you to create an effective training space within your workplace. We strive to add value at all levels, from the overall layout of the space, to the furniture that goes into it. We design and manufacture our solutions in house which allows us to provide an unparalleled level of customisation and we incorporate your branding to ensure the overall space reflects your corporate identity.